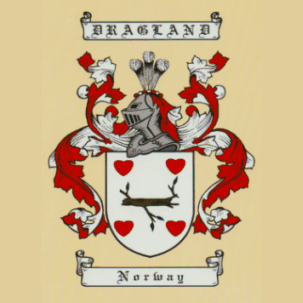 The Dragland family originated in a small village named Dragland on the island of Tjeldøya in the borough of Tjeldsund on the north west coast of Norway, (near the cities of Narvik and Harstad, and the town of Lodingen.) Tjeldsund has been an important traffic artery between north and south for a very long time. A rich cultural landscape which includes finds from the Stone and Iron Ages tell about settlements here through thousands of years. For example, the Steinsvik Sword, one of the finest Viking weapons ever recovered, was found at Hov, on Tjeldøya Island not far from Dragland. We are all descendants of Nils Hallvardson Limmesand (1750 – 1804) and Randi Olsdatter (b.1750). Nils and Randi had 10 children, and many grand children, some of whom moved from Limmesand to Dragland in 1846, and the name stuck. In the late 1800’s and early 1900’s the promise of fortune in the new world lured many of the family members to emmigrate to the USA and Canada, while the rest remained in Norway. Over the years, the two groups almost lost contact, but now with the advent of the Internet and email, we are coming together again! I am very interested in my family. My dad Oris Lemual Dragland is the son of Linn and Geena Bakke Dragland. Please reply. We do have your grandfather and father on our family tree (See ref # 177.5 and 177.51) although the spelling is slightly different. I would be happy to work with you to update your branch of the family. Hi my family came from Norway in the 1800s, my name is Mark Draland, My grandfather was Oris Draland, I am wondering if this is where we came from?